Hungarian educator; born at Trencsen-Bán June 12, 1819; died at Budapest Dec. 18, 1889. After teaching in the elementary schools of the provincial communities of Lovasberény and Kecskemét, he was called to the Talmud Torah school of Budapest in 1859. Enjoying a high reputation as an educator and a scholar by virtue of his attainments in Jewish science and his literary activity, he was appointed in 1868 director of the reorganized Jewish Teachers' College, and in 1876 professor of the Bible and Talmud in the lower division of the newly founded Rabbinical Seminary. 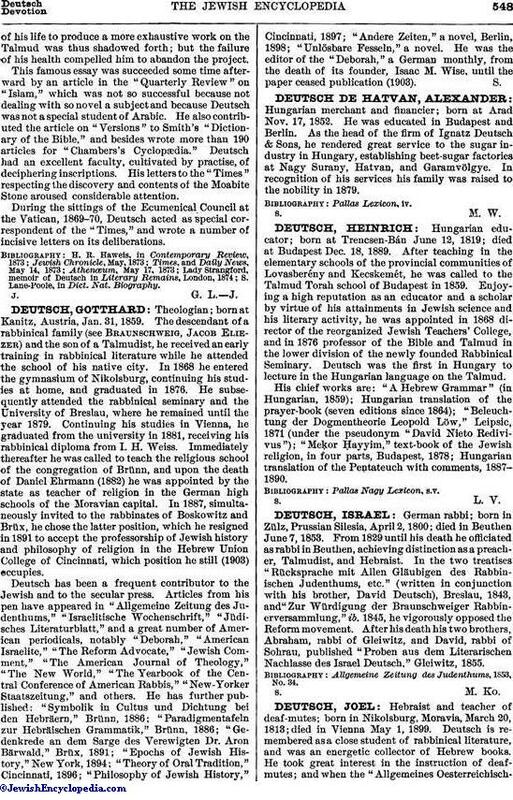 Deutsch was the first in Hungary to lecture in the Hungarian language on the Talmud. His chief works are: "A Hebrew Grammar" (in Hungarian, 1859); Hungarian translation of the prayer-book (seven editions since 1864; "Beleuchtung der Dogmentheorie Leopold Löw," Leipsic, 1871 (under the pseudonym "David Nieto Redivivus"); "Meḳor Ḥayyim," text-book of the Jewish religion, in four parts, Budapest, 1878; Hungarian translation of the Pentateuch with comments, 1887-1890.